As we celebrate the milestone of translated Scripture in more than 3,350 languages, we celebrate that God is accomplishing His mission through His power and through partnership. More mission organisations, churches and Christian communities are becoming involved in the Bible translation movement. At least 1.5 billion people do not have the full Bible available in their first language. Over 700 million of these have the New Testament; others have portions or at least some level of translation or preparatory work begun. Because of improved accuracy in collecting information from around the world about Bible translation needs, and other factors, the number of estimated translation needs worldwide has increased. As of 1 October 2018, over 180 million people, using 1,879 spoken languages and 284 sign languages, are likely to need some form of Bible translation to begin. Translation need is not as simple as determining which languages do or do not have Scripture. Most of the languages with only ‘some Scripture’ are in need of more, and even full Bibles undergo revisions from time to time. Find out more in the FAQ sheet. Today approximately 100 organisations from more than 60 nations form the Wycliffe Global Alliance. By providing staff, funds, training, translation and support services, Alliance organisations are currently involved in at least 2,139 of the 2,659 languages known to have active work. Wycliffe Global Alliance organisations and personnel have been involved in the translation of Bibles and New Testaments in more than 1,000 languages. At least one of the Bible’s 66 books has been published in an additional 700 languages. Many other languages have other initial portions published. Thanks to the work of ministries including Faith Comes By Hearing, Jesus Film, Bibles.org, YouVersion, Scripture Earth, and software such as Paratext and Scripture App Builder, Scripture is available online and in digital forms that can be shared phone to phone in in over 1,600 languages. Find.Bible maintains a growing public list of where to find Scripture across these and other sites. There are many additional partnerships and new initiatives contributing to the growth of Bible translation movements and the distribution and use of God’s Word. Working in community partnerships, Alliance personnel not only assist in Scripture-related goals but also help produce thousands of resources for literacy, education, health and other community-based objectives alongside Scripture. Statistics are rarely as simple as the numbers imply. Please read the FAQ sheet before quoting these figures. 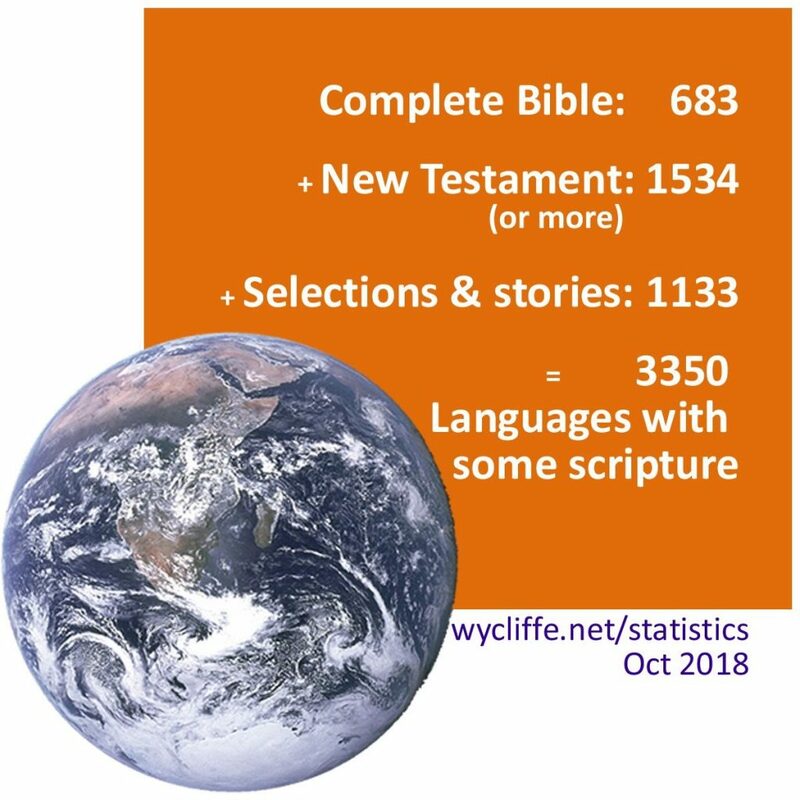 Wycliffe Global Alliance presentations of Scripture and Language Statistics are compiled from data provided through progress.Bible by Wycliffe Organisations, SIL International, United Bible Societies and many other partners. Data is current as of 1 October 2018. Population data is based on available information about first language speakers in SIL’s Ethnologue. Further stories about people and projects are available at www.wycliffe.net. From http://www.wycliffe.net/en/statistics Copyright © 2018 Wycliffe Global Alliance.